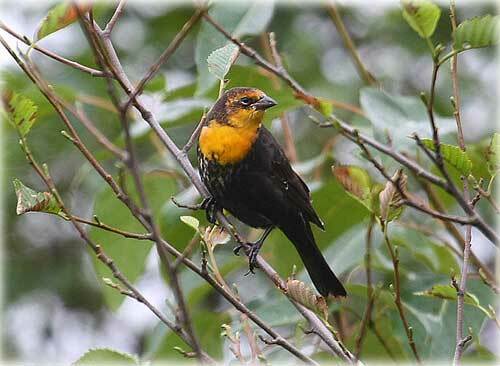 This Yellow Headed Blackbird was photographed in August. It is reported to be the second known sighting in the Ketchikan area. Ketchikan: Disney Wonder Bound For Alaska In 2011 - For the first-time ever, Disney Cruise Line will offer Alaskan cruises during a four month season of seven-night sailings aboard the Disney Wonder in the summer 2011. Disney Wonder will depart out of Vancouver, B.C., calling on popular ports such as Ketchikan, Skagway and Juneau. The first-ever Disney cruise to Alaska will depart on May 3 with the last cruise of the season scheduled for Aug. 30. Ketchikan: Local University Faculty Participates in Updating National Welding Curriculum - The National Center for Construction Education and Research (NCCER) has recently recognized UAS Ketchikan faculty member, Steve Brandow, for his contributions in revising and updating the national welding curriculum which supports the American Welding Society's (AWS) standards and guidelines. Specifically, the revisions support the publishing of the fourth edition of Welding Level One, a trainee guide. Juneau: Forest Service issues decision for Juneau, Admiralty motorized vehicle use plan - The U.S. Forest Service has made a decision on the Juneau Ranger District (JRD) and Admiralty National Monument (ANM) Access Travel Management (ATM) Plan. Juneau District Ranger Pete Griffin and Admiralty National Monument Ranger Marti Marshall this week issued a Decision Notice (DN) and Finding of No Significant Impact (FONSI)-summarizing the Environmental Assessment (EA) for the project, documenting the selection of Alternative 2, and explaining the basis for the decision. Alaska: State Encourages Instruction During School Closures - Alaska Education Commissioner Larry LeDoux signed an emergency regulation that provides an incentive for school districts to offer instruction during emergency closures. The regulation, signed September 1, took effect immediately and expires on December 29, 2009, by which point the State Board of Education & Early Development will have had time to consider making the regulation permanent through the usual public regulatory process. The regulation was signed as an emergency measure because there could be lengthy school closures during the H1N1 flu pandemic. However, the regulation applies to any cause of emergency closure, such as blizzards, fires and floods. Essentially, the regulation sets criteria by which school closures can be counted as days in session. Per state law, public schools must be in session for at least 180 days a school year. When districts close schools for a day or two for an emergency, they often can make up the days by adjusting their calendar. For example, to make up for a snow closure, districts might cancel a teacher training day or add a day to the school year. But when districts have long closures, such as for a week or two, it may be hard to make up those days by adjusting the calendar. Alaska: State Archives Reopened to the Public - The Alaska State Archives in Juneau reopened to the public last week after being closed to the public since August 17, when rainwater entered the building through the roof during repairs. Approximately 1,000 boxes of documents, as well as some audiotapes, maps and blueprints, were subjected to water in varying degrees. No permanent damage to the materials, which range from territorial days to the present, has been detected to date. As of September 4, approximately 900 boxes' worth of materials have been dried and re-boxed. Of the remaining 100 boxes' worth of materials, 85 are nearly dry and 15 are being kept in a frozen condition until they can be worked on. Freezing the documents prevents mold from forming on them. TOM PURCELL: An Over "FED" Mind - I don't recall exactly when it began but I wish it would stop: I think about the federal government all the time now. There is no way to avoid it. Every time I turn on the tube, President Obama is on -- or there are people talking about what he is trying to do. Every time I go to a cookout or party, the conversation always turns to politics and worries about what our political class is trying to do. Every time I do anything -- fill up at a gas station or flush a commode -- the federal government is shadowing me; its policies affect everything from the price of gasoline to how much water a commode can use. FLOYD & MARY BETH BROWN: Trillions in Debt will Make America Poorer - How much is a trillion dollars? Mathematically it would be expressed with this simple equation: A trillion dollars = $1,000,000,000,000. It takes 12 zeroes to the left of the decimal point to make a trillion. Or in other words, a trillion is a million million dollars. Time magazine tried to put it in perspective this way: "When trying to comprehend a trillion-dollar deficit, you might calculate how much money that represents per person in the U.S. One trillion dollars divided by 300 million Americans comes out to $3,333. Then you search for a useful comparison. A convenient -- though perhaps unsettling -- comparison is to the amount of credit-card debt carried by the average person in this country. That figure is $3,245." We find it hard to wrap our minds around such a large number. President Barack Obama doesn't share this affliction. He is pushing the U.S. Senate to raise the U.S. debt ceiling beyond $12.1 trillion. This year's deficit alone is set to surpass $1.8 trillion. DALE MCFEATTERS: Obama should back up tough talk on Wall Street - The Associated Press account of the president's lecture to Wall Street begins:" "President Barack Obama sternly warned against returning to reckless and unchecked behavior that had threatened the nation with a second Great Depression." A year ago was the nadir of the financial meltdown. Lehman Brothers went bankrupt. So did Washington Mutual. There was the fire sale of Merrill Lynch and Bear Stearns. The massive bailout of AIG. The government takeover of Fannie Mae and Freddie Mac. As Obama noted, $5 trillion of American household wealth evaporated in just three months. The outgoing Bush administration and the incoming Obama administration vowed never again. We had learned our lesson. Memorial Fund By Deborah Harney - Every mother loves her son, and as far as I know, only one mother in history had a perfect, blameless one. That being said, I hope that any funds generated by the Jared Azure Memorial Fund will be donated to Kyle Palmer to help pay his medical bills as he recovers in intensive care with no insurance.